The league announced Friday the Aug. 25 contest between the Toronto Argonauts and Montreal Alouettes will be held at Stade Croix-Bleue Medavie Stadium on the University of Moncton campus. It will mark the fourth time the CFL has held a regular-season game there, but first since Sept. 21, 2013 when the Hamilton Tiger-Cats edged the Montreal Alouettes 28-26. The return to Moncton continues the CFL's drive to put an expansion club in Halifax. The contest is being presented by Schooners Sports and Entertainment (SSE), the owners of the proposed Halifax CFL franchise — the Atlantic Schooners. Anthony LeBlanc, an SSE founding partner, said the hope remains for the Schooners to be operational in 2020. But in that scenario, the franchise would play its first season or two in Moncton, while a new stadium is being built in Halifax. "We've said all along for a team to be successful in Atlantic Canada . . . it's got to be regional," LeBlanc said. "So this for us is just a great way to do it. "We've been pretty open that a building in Halifax still needs to be built and while we hope to get approvals this year, it's going to take time before that building is built. So one of the things we started discussing with the city and province here is what about playing a year or two in this facility (Stade Croix-Bleue Medavie Stadium)? What better way to kick-start that whole regional concept." Moncton got the nod ahead of Saint John, N.B. and Antigonish, N.S. 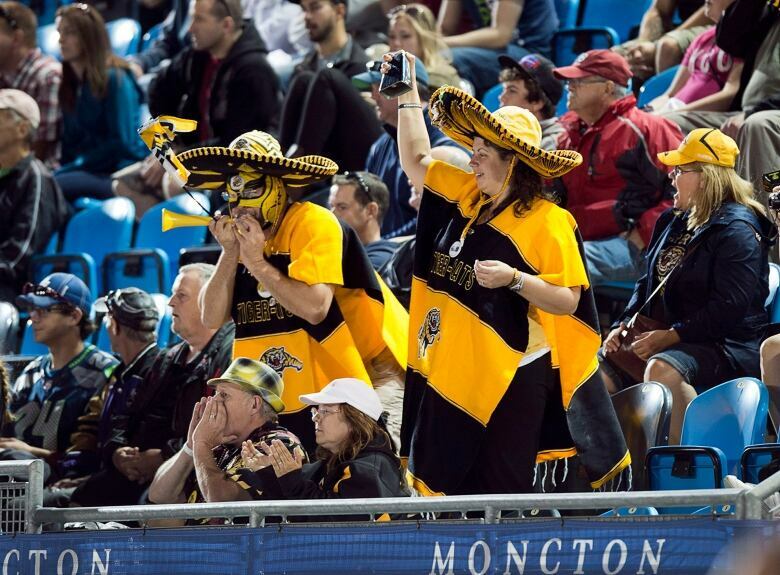 A big reason for that was the presence of Moncton's stadium, a facility with 10,000 permanent seats that be expanded to 20,725 via temporary seating. The regional approach is one the Saskatchewan Roughriders have perfected. While the franchise plays in Regina, fans travel from all over the province to games. Last season, the Riders averaged a CFL-best 32,835 spectators at Mosaic Stadium, or 98 per cent capacity. 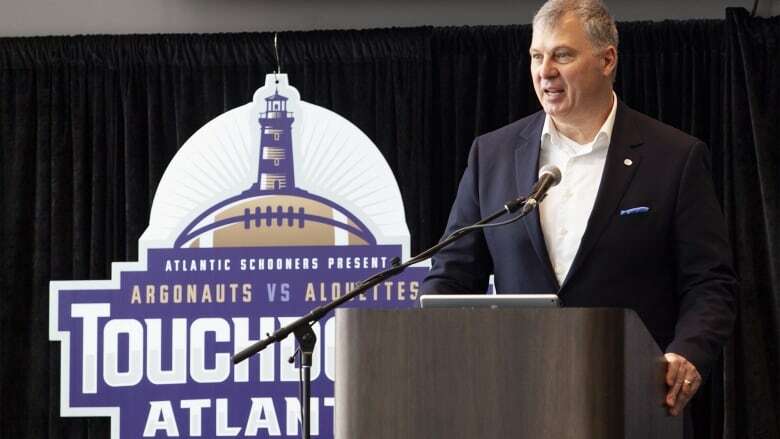 "I think this (Touchdown Atlantic game in Moncton) is part of a regional strategy and I like it," said CFL commissioner Randy Ambrosie. "I'm seeing these guys are clearly sports operators because they think about things in a very cool way. "They're very committed to the idea when this project is completed, it belongs to the entire Atlantic region. I think this is a very positive step in that direction." While Halifax is Atlantic Canada's largest city (with a population of about 410,000), Moncton does present an attractive alternative. Not only does the city of roughly 72,000 residents have a suitable stadium, it's just 262 kilometres from the Nova Scotia capital and is centrally located for potential Maritimes football fans. Moncton is nicknamed the "Hub City" because of its location and has hosted some of the biggest concerts in Atlantic Canada — with U2, The Rolling Stones and AC/DC making visits. The biggest hurdle facing SSE is a suitable stadium. Talks continue with the Halifax Regional Municipality (HRM) regarding a 24,000-seat facility proposed for Shannon Park, a 38-hectare area of land on the east side of Halifax harbour. Still, LeBlanc remains bullish on the CFL coming to Atlantic Canada. "I'd say the odds are incredibly high." he said. In February, LeBlanc told The Canadian Press his group had established a self-imposed deadline of the end of June to determine either to go ahead with the Schooners project or move on. He reiterated that again Friday. "I still think by June, while I doubt we'd have any firm approvals, we should see the writing on the wall," he said. "My personal view is I'd like to know what's happening by the time we host this game in August. "I think that's reasonable. Having said that, I have to give Halifax full marks. They're still waiting on some final pieces of information from us in our proposal that's taken longer, to no one's fault, to finalize." Toronto, which had the worst home attendance in the nine-team league last season, will be the Touchdown Atlantic home team and will give up a contest at BMO Field in 2019. The Argos also played in the inaugural Touchdown Atlantic game in 2005, a 16-16 exhibition tie with Hamilton. Toronto was also part of the first of three-regular season games in Moncton (2010, 2011 and 2013). Tickets for the game will go on sale April 15 and start at $65. That's significantly more than what both the Argos ($16.30 per game) and Alouettes ($19.90) offer in their most competitive season-ticket packages. "Our research indicates the prices moving forward are reasonable for a one-time event," LeBlanc said. "If it was a full season, then yeah, I think we'd have to adjust them a little bit. "But we've spent a lot of time to ensure the fan experiences will be much different at this game than it was at the most recent one six years ago. There's going to be a lot of different offerings." People who've made a deposit for Schooners season tickets will be able to secure their Aug. 25 seats starting April 8.